Given that the Palestinian mission in Washington is not an embassy, Zomlot is not an ambassador. He is an envoy, or head of the delegation. 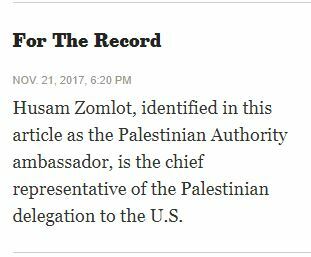 The New York Times accurately referred to Husam Zomlot as an envoy (not ambassador) earlier this month. Palestinian representation: In the Nov. 19 Section A, an article about the Trump administration threatening to close the Palestinian Authority representative’s office in Washington referred to Husam Zomlot as the Palestinian ambassador to the U.S. He is the chief representative of the Palestinian delegation to the U.S.